The first graduate of a new UCF degree program – the Bachelor of Science in Photonic Science and Engineering – will earn his diploma Thursday and is looking forward to entering a field that is poised to boom in the coming years. Andrew Kirk came to UCF to study aerospace engineering, but when he took one of his early physics classes it sparked an interest in optics. Then, two years ago at the end of his sophomore year, he heard about the new undergraduate program to be offered by UCF’s College of Optics & Photonics and the College of Engineering & Computer Science. It’s the first such program in Florida and only the seventh in the nation. The program started at UCF in 2013 and now has 70 students enrolled. For information about UCF’s graduation ceremonies click here. “After researching the field…it became clear that it would revolutionize technology and that’s when I decided to switch majors,” said Kirk, who is from Cooper City just southwest of Fort Lauderdale. That revolution is just around the corner, he said. The Bachelor of Science degree will enable students to analyze and design optical and laser systems for a broad set of applications. 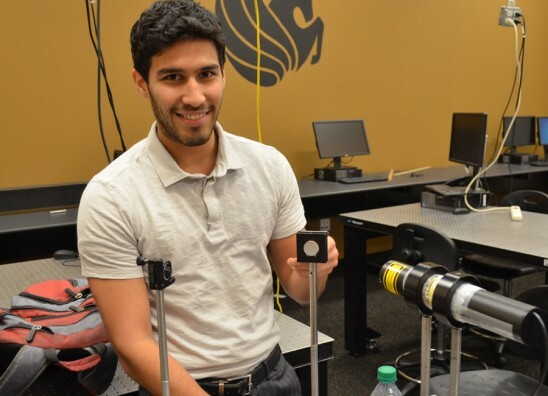 While attending UCF, Kirk also has been working at Lockheed Martin on a college work-experience program in research and development of next-generation infrared optics. When he graduates, he has a full-time job already waiting for him in the company’s advanced materials engineering group, and he plans to return to UCF to earn a master’s. Kirk said he had a jump on finishing the degree requirements because he had already completed many of the required engineering courses when he switched fields. “There are many research opportunities for undergraduate students,” he said. “There is also an expanding job market for this specialty, making graduates of CREOL that much more valuable.” CREOL is the Center for Research and Education in Optics and Lasers, which is part of the College of Photonics and Optics. UCF’s new program is distinguished by the fact that more emphasis is placed on photonics than optics, said Mike McKee, associate director of the college’s undergraduate program. Generally, optics deals with the science of light including lenses and mirrors, whereas photonics deals with the technologies that incorporate light, such as LED displays, solar panels, use of lasers, and communications. McKee said the U.S. Department of Labor forecasts a need of about 29,000 engineers in this field in the next decade. Going to class full-time and working can make for a heavy load, but Kirk said one of the key lessons he learned in college is the importance of time management. Kirk will graduate during the commencement ceremony at 9 a.m. Thursday, May 7. Bravo, great job Andrew you made our family very proud!